"Vignola, who possesses jaw-dropping technique, wears his influences on the tip of his pick"
It's been almost a year since Top Guitarist Frank Vignola catapulted into a tree from an off-road-vehicle in a tragic accident that nearly took his life. After being air-lifted to a renowned N.Y. area trauma center, Frank's family learned of his extensive injuries which included four broken ribs, a broken clavicle, shoulder (in two places), and arm, which has since required multiple surgeries. Additionally, Vignola suffered two collapsed lungs and massive internal bleeding. Enduring a long but steady recovery, Frank returns to the stage in collaboration with the John di Martino Trio performing great American popular songs by Gershwin, Porter, Van Heusen, Berlin, Bernstein and more. He is grateful, and he's excited to be back to introduce Frank Vignola with the John di Martino Trio. Frank Vignola, born December 30th, 1965, is one of the most extraordinary guitarists performing before the public today. 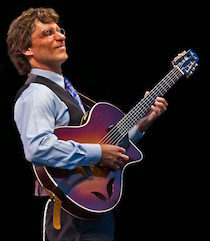 His stunning virtuosity has made him the guitarist of choice for many of the world's top musicians, including Ringo Starr, Madonna, Donald Fagen, Wynton Marsalis, Tommy Emmanuel, the Boston Pops, the New York Pops, and guitar legend Les Paul, who named Vignola to his "Five Most Admired Guitarists List" for the Wall Street Journal. Vignola's stellar technique explains why the New York Times deemed him "one of the brightest stars of the guitar". John di Martino is a jazz pianist, arranger and producer, based in New York City. He has been described as a "shape-shifter", for his creativity across musical genres. John has performed and recorded with David "Fat Head" Newman, Pat Martino, Houston Person and Taj Mahal. Mr. di Martino is a sought after musical director. He has accompanied Jon Hendricks, Keely Smith, Billy Eckstine, and Janis Siegel. John's talents as arranger and pianist can be heard on recordings with Gloria Lynn, and Grady Tate. John's discography includes many Grammy nominated cds, among those are: "Love" with Issac Delgado, "Freddy Cole Sings Mr. B", and "Live & In Clave" with Bobby Sanabria.